Two-state proponents argue that comprehensive peace is only possible with deeper American involvement in the process. They couldn't be more wrong. “The conflict over geographic Palestine — the land between the Jordan River and the Mediterranean Sea — is widely misunderstood in the United States.” Observers have been writing versions of that sentence since 1948, when the state of Israel was created and the question of Palestine became crucial for the US presence in the Middle East. And the sentence has remained essentially correct, even though perhaps no foreign affair is more closely watched by major media outlets or more ponderously discussed in highbrow journals of opinion. For decades, the perplexity was rooted in uncritical acceptance of the stock narrative of Israel’s founding: “a land without a people for a people without a land.” As this people had been downtrodden for centuries and then murdered with mechanical savagery in Europe, this story of Israel offered a providential comfort. Increasingly, though, it is fear that explains the persistent confusion — fear of knowing too much, to borrow the title of Norman Finkelstein’s 2012 book, about the erosion of pro-Israel sentiment among liberal American Jews. The truth about Israel’s origins, that the people without a land took a land from its indigenous population, leaves the arc of history bent backward toward injustice. That, in the prototypical American psyche, means that the story is incomplete. It is scary to think that the tale has no happy ending, that suffering sometimes begets more suffering, that a successful project of settler colonialism is predicated on displacement and dispossession. Many Americans simply spare themselves the cognitive dissonance by believing that all Palestinians, if not all Arabs, are potential terrorists, or that God ordained the ingathering of the Jews as a sign of the Second Coming of Christ. Others just turn off the television. But for a swath of the population, one overlapping heavily with the chattering classes, it is important to believe that the US government is doing all it can to bring about narrative closure, otherwise known as “Middle East peace” — a conceit related to liberal mystification of the nature of the American state itself. Rashid Khalidi is a Palestinian American who has long urged the US government to fulfill this historical mission, even as his scholarly output has become quite skeptical of its actual role. A Columbia University historian, Khalidi was formerly president of the American Committee on Jerusalem (now renamed and, without Khalidi, refashioned as the American Task Force on Palestine), a group that advocated for an end to Israel’s military occupation of the West Bank, East Jerusalem, and the Gaza Strip. He was also an adviser to the Palestinian delegation at the US-sponsored Israeli-Palestinian negotiations that began in Madrid in 1991. His commitment to the vision of a two-state solution to the question of Palestine, along with his many skillful media appearances over the years, has made Khalidi the bane of hardliners in America’s pro-Israel lobby, who seek to blackball him at every turn. In 2008, news that Barack Obama attended a 2003 farewell dinner for Khalidi, who was then leaving the University of Chicago for Columbia, sent the lobby into a frenzy. Obama said that the professor had reminded him of his “blind spots,” one of a string of statements that seemed to indicate that the presidential hopeful was suspiciously sympathetic to Palestinian views. The Los Angeles Times , which broke the five-year-old story, had a videotape of the event at which other speakers were rumored to have been strongly critical of Israel. The John McCain campaign joined the lobby’s chorus, accusing the Times of “suppressing” the tape; the Obama team disavowed its man’s connection to Khalidi, as it had done with Bill Ayers and Jeremiah Wright. But the “idiot wind” of accusations, as Khalidi called it, succeeded in its larger goal: prodding Obama to issue ritual declarations of undying support for Israel. As president, Obama has repeated these pledges with increasing fervor, even as his own half-hearted attempts to resolve the question of Palestine have met with utter Israeli intransigence. There is no puzzle here: the liberal faith in the energy and integrity of US peacemaking is misplaced. Indeed, as Khalidi argues in his latest book, Brokers of Deceit , the US has actively obstructed the pursuit of peace by adhering to Israel’s view of what can be achieved and Israel’s schedule for achieving it. It is not a new argument among specialists — Dishonest Broker by Naseer Aruri is a comparable text — but one may hope that Beacon Press will market it to a larger audience. Khalidi’s key document is a CIA memorandum penned in 1982 to brief the higher-ups on “US-Israeli Differences Over the Camp David Peace Process.” At Camp David in 1978, Israel had grudgingly agreed to future talks about a “self-governing authority” in the Palestinian territories. President Jimmy Carter could not get those talks started before he left office, and the Reagan administration, keen on Israel as a Cold War ally, was in no hurry to do so either, at least at first. But in the summer of 1982, Israel invaded Lebanon to expel the PLO, and the Reagan White House fielded several phone calls from Arab capitals irritated by the passive US response to the ensuing destruction. Accordingly, Reagan approved an initiative aimed at stopping the growth of settlements, ending the post-1967 occupation, and ushering in some form of Palestinian self-rule. It was an uncanny prediction of how not just Begin, but also subsequent Israeli leaders, would behave. 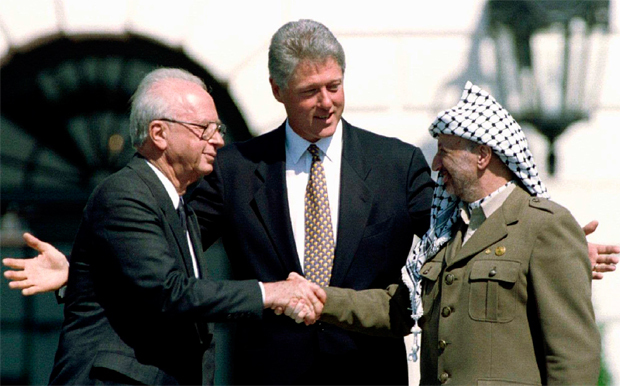 When the Reagan plan bit the dust, when the Madrid effort of the early 1990s stalled and, most consequentially, when the Oslo process of the mid-to late-1990s fizzled, the reasons were the same: Israel would permit no Palestinian sovereign entity in the West Bank; Israel would not recognize East Jerusalem as part of the West Bank; and Israel would take no responsibility for the Palestinians made refugees in 1948 or their descendants. And Washington would exert none of its ample leverage to compel the Israeli leadership to reconsider these positions, even though the first two flout UN Security Council resolutions and the third an overwhelming international consensus. In practice, however, the US has done nothing to slow the shrinkage of the putative Palestinian state’s territory, as the settlement project proceeds apace. And Washington has moved vigorously to suppress Palestinian shows of independence, most brazenly in September 2011 when Ambassador to the UN Susan Rice rallied a vote to block Palestine’s statehood application before the Security Council. Khalidi invokes Orwell to describe the resulting impasse, wherein words like “peace process” “give an appearance of solidity to pure wind.” Gramsci is the better guide: the question of Palestine is stuck in a diplomatic zombieland, a place where the hegemonic discourse bears vanishing relation to facts on the ground, where secretaries of state mouth pieties they know but cannot admit to be empty, where the old is dying and the new cannot be born. The present tragedy of Israel-Palestine is not that the two-state solution is moribund. It is that the one-state reality in the land between the Jordan and the Mediterranean cannot be acknowledged, much less acted on, by those with the power to let it speak its name. What is to be done before this dispiriting tableau? The answer depends on one’s diagnosis of why the US has acted as “Israel’s lawyer.” An influential view, associated with State Department Arabists, holds that the explanation lies in the clout of the pro-Israel lobby, which is able to intimidate politicians with vows of Jewish campaign donations withdrawn and Jewish and evangelical Christian votes withheld. This interpretation gained much additional visibility with the 2007 publication of The Israel Lobby by prominent political scientists John Mearsheimer and Stephen Walt, who, as adherents to the realist school of international relations, emphasize that uncritical US backing for Israel deviates from the US national interest in the Middle East. To the extent that the national interest is a category of analysis, and not just a set of policy prescriptions, surely it is to be found in another tautology: it is what the American ruling class has historically perceived it to be. Since 1967 the power structure, whether Democrat or Republican, liberal-internationalist or neoconservative, has found steadfast support for Israel to be a vital US interest. As Obama put it, “this bond is unbreakable.” Why? Khalidi advances a more sophisticated domestic political analysis, coupling the influence of lobbyists like Abrams and Ross with the absence of a countervailing force. As former National Security Council staffer William Quandt writes of his time on the job in the 1970s, “the Palestinians had no domestic constituency” to compete with the pro-Israel lobby for the ear of presidents. But the strategic dimension has driven US policy more than electoral calculations. During the Cold War, and particularly after its crushing military victory over Soviet-armed Arab states in 1967, Israel was seen as the most reliable US ally in the Middle East. US intervention in the 1973 Arab-Israeli war followed Cold War logic: the Nixon administration airlifted armaments to Israel to ensure it would prevail against Soviet-armed Egypt and Syria. Egypt had already signaled its willingness to become a US client-state by expelling Soviet advisers in 1972. Its loss in the 1973 war advanced that process. After the Cold War, Israel retained its value to US strategic thinkers as the ultimate bulwark against the spread of political Islam, which took the place of communism in their minds (or at least in their rhetoric) as the number-one ideological rival to liberal capitalism. But the overriding US interests in the region, as laid out in a 1978 Joint Chiefs of Staff memorandum, are “to assure continuous access to petroleum resources” in the Persian Gulf and “to prevent an inimical power or combination of powers from establishing hegemony” in the oil patch. During the Cold War, the “inimical power” was the Soviet Union; in 1990, it was Saddam Hussein’s Iraq. Today, the term might apply to a regional rival like Iran or a rising global power like China. The US military guards not only the friendly petro-princedoms of the Gulf but also their hydrocarbon riches on behalf of the world economy. Its Gulf deployment thus undergirds global acquiescence in the US claim to be the sole superpower. Multi-front Arab-Israeli wars threaten this arrangement — hence the US-brokered Israeli treaties with Egypt and Jordan — but the steady colonization of the West Bank does not. As Khalidi explains, there is no countervailing force on the regional stage either, because Saudi Arabia is too solicitous of its special relationship with Washington to rock the boat. To frame it another way, the US benefits tangibly from its other special relationship, that with Israel, but pays no strategic cost. The big picture is bigger still. To maintain Israel’s “qualitative military edge” over any possible combination of its Arab neighbors, the US has sent $67.4 billion in military aid to the Jewish state since its inception — well over half that amount since 1997. Most of these transfers have taken the form of Foreign Military Financing, a cash grant whose rules stipulate that the money must be spent on purchases from American arms manufacturers. Thanks to its friends in Congress, Israel has a special deal whereby 22 percent of its boodle is exempted (presumably, the set-asides are lavished on the Israeli weapons industry). But the sheer volume of aid — in 2012, grants to Israel made up 60 percent of the Foreign Military Financing handed out worldwide — guarantees that American arms manufacturers have a vested interest in a tight US-Israeli alliance. The pro-Israel lobby gets it: the Jewish Institute for National Security Affairs is a lesser-known but extremely important lobbying organization that exists to cultivate these ties. Israel gets it: in 2007, Prime Minister Benjamin Netanyahu signed a pact whereby the entirety of the annual aid package would be military after two years. It is no accident that support for Israel tends to be more unstinting at the Pentagon than at the State Department. One might contend that, together with the enormous arms sales to Saudi Arabia and other Gulf monarchies, military aid to Israel sustains a sort of permanent war economy in the Middle East. The US presides over a regional system so fraught with political tensions that periodic crisis is almost inevitable. But, from the war economy point of view, crisis is productive: it assures that weapons stocks will be depleted, and thus need to be replaced, while permitting the US client-states to perennially defer grappling with their political problems by pointing to the urgent priority of “security.” To the American strategic class, therefore, conflict management comes to seem low-risk, high-reward, while conflict resolution is high-risk, no-reward. The question of Palestine is therefore bound up with the fate of US empire. Those who hope against reason for a two-state solution posit that the chances for a comprehensive peace are stronger the deeper the US involvement and the greater the US prestige in the Middle East. The reverse is likely true, but the proposition is unlikely to be tested, for settlements, bypass roads, and separation barriers are sprouting in the West Bank much faster than US empire is fading. For those who are not wedded to any particular solution to the question of Palestine, who merely wish for maximum justice with minimum additional bloodshed, the imperative is clear: one way or another, Washington’s death grip on Middle East peacemaking must be broken. Chris Toensing is the executive director and editor of Middle East Report. Two-state proponents argue that comprehensive peace is only possible with deeper American involvement in the process. They couldn’t be more wrong.